Do people have power ? Our newly married couples routinely express joy & delight, having followed our guidance. We all want to mark the special days in our lives with celebration and to make these matter, they should reflect our outlook on life. Being able to have a humanist wedding ceremony is very special, because it embodies the notion of a very personal and spiritual ceremony which reflects both of you, as individuals and as a couple. Since 2005, a Humanist wedding allows you to have a legal ceremony that focuses on your values while still allowing you to express your individual personalities. Whether your style is traditional or whimsical, formal or casual, your celebrant will help you compose your perfect ceremony, making it so memorable for everyone involved. Our celebrants commit to only your ceremony on your chosen date and we usually have availability for those latecomers. We also guarantee a stand-in legal celebrant in the unlikely event of some unforeseen emergency. Humanism, which is non-religious, offers a philosophy of life and ethics, based on a concern for humanity and the natural world. It is simply based on common sense, unselfishness, kindness, care and consideration for others, whilst accepting responsibility for our own lives, the influence we have on others and on the world around us. Our approach is not constrained by religious scripture, nor by the neutrality demanded by civil law. And although we differ widely on the basis for such, we hold many values in common with those who have religious beliefs and it is with these shared values in mind that we gather together as one community, to celebrate a marriage in a way that confirms your togetherness. Having chosen a place/venue that speaks of how you wish to live your lives, with originality, with joy and with delight in the beautiful world in which we live, many couples choose to compose a ceremony in their own way and in their own style, speaking words and making gestures which represent their love and their commitment to each other. Unique, personal and memorable. 1 Why do more couples . .
"Hi Steve > We had an amazing day and thank you so much for delivering such an amazing ceremony! It was brilliant! Thank you so much for all you have done, it was all perfect!" I just wanted to write and thank you for playing such a big part of our wedding. I spent three months building myself up for the ceremony and wanting to get it over with and get to the party, but on the day it was my favourite part of our wedding day & the part I keep thinking of. Thank you for helping me relax when I got to the end of the aisle & for lightening the mood when it was getting a bit emotional. Absolutely everyone who came through our receiving line told us how much they loved our ceremony. Even our photographers said it was one of the most emotional ceremonies they have been too! We can't thank you enough, as you really set the tone for our day & made it so special for us. We had the perfect day yesterday and we just want to thank you so much for the lovely words.Everyone complimented the ceremony and said how personal it was. We really loved it. Thanks again for everything, you've been great through this whole process. And a massive thank you for sorting the marriage certificate - that was great! Thank you again so much for all of your help and support in helping us create our perfect ceremony. Your advice and guidance was so appreciated by us and the result was that we had the ceremony of our dreams. So many people commented on how beautiful, emotional and special our wedding ceremony was and said how touched they were. We both loved every second of our wedding day. We just wanted to send you our thanks for helping to make our wedding day, truly the best day of our lives. The service was absolutely fantastic, exactly what we hoped for and was really well received from all of our guest. We never got tried of hearing “ It was the best wedding we’ve ever been to!. You really helped put us both at ease with your calm, friendly and professional manner and it obviously showed how well we connected as many guests asked if you were a friend before the wedding, Well, obviously, now we hope you would count us as friends as we do you. So thank you again from the bottom of our hearts. I wanted to drop you a line to thank you most sincerely for the wonderful job you did as Celebrant at our wedding. We were both really relaxed and enjoyed the whole ceremony enormously, that of course, in no small way, was down to you and the lovely style and manner you have. You have a fantastic talent and we are delighted that we asked you to help us with our big day. Thank you very much for the ceremony that you conducted at our wedding. You did a great job on prioritising a top class service. All of our guests commented on the ceremony and myself and Suzanne were totally moved by it. If anyone we know requires a humanist we will certainly be recommending you. Thanks again for making our big day extra special. Just to say a big thanks for all your help for making our day special everyone is still raving about it. It was a great laugh and one of the funniest weddings they have been to. Firstly thank you so much for such a fantastic ceremony on the banks of the Tay. We couldn’t have asked for it to be any more ideal and we are still on a high from the whole experience. We have had such lovely feedback from our family and friends, particularly about the ceremony being so personal, which exactly what we all wanted, including yourself. It was a real pleasure meeting you and we both wish you well. Grant and I would like to pass on our thanks for everything you did on the day, the ceremony was perfect. The whole day went really well and Grant and I are currently awaiting our flight to Cancun, which will top off the whole experience. Once again thank you so much for helping us have the kind of ceremony and wedding we desired. I'll send you a photo when I get some !! Many many thanks for making it a wonderful day . Everyone that was there says it was a fantastic ceremony and is the best Scottish wedding that they have ever attended as it made everyone feel involved and relaxed so we all thank you from the bottom of our hearts for such a fantastic day. We just wanted to thank you for everything you did for us, at such short notice as well! People are still talking about our wedding and we are sure they will be talking about it for weeks to come! It was such a lovely ceremony which wouldn't have been possible without your help and guidance. 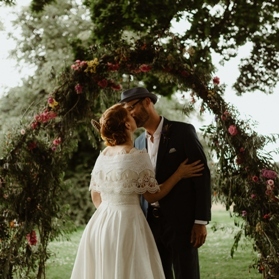 Humanism is not something which we automatically thought about when planning our wedding, but we are both so happy with our choice which made our ceremony much more personal and encompassing. "If you are looking for a very personalised ceremony then look no further. We planned a wedding at very short notice (52 days!) and chose Stevie to conduct our big day. He was perfect. From our initial emails and then meeting he was there to guide us all the way in the lead up to what became a very special, truly personal and absolutely beautiful wedding. When we first met Stevie put us both at ease immediately and his sense of excitement for us was obvious. He listened to our very long story of our already 18 years together and our vision for our day and became completely absorbed in it. During the following weeks we had more meetings and many emails. Our children met with him and instantly loved who was going to be such an integral part of our (and their) day. Stevie has an easy manner which relaxes you but do not think that underneath the swan like exterior he isn’t paddling like god knows what to get everything done just perfectly! As time went on we looked forward to the emails with the latest updates in place after meetings to our “script”. The time he invested in making sure our wedding represented us and our family was amazing. We chose to get married in the back of beyond and he had no qualms in travelling to our venue as our setting was very intimate - a little secluded lodge within a woodland as we had envisioned. It was over two hours drive each way but he became almost as excited as us when we found our special spot. On the day he arrived well ahead of time. So much so that after a quick cup of tea my daughter enlisted him to help with the outside decor. The actual ceremony was perfect. We were all so relaxed and happy and this is largely due to the fact that it was a let’s just run with it and all feel good atmosphere which Stevie encouraged. I really can’t say enough good things about this celebrant. Thank you so much Stevie for your warmth, enthusiasm, patience, guidance, support - and not to forget sense of humour and your all hands on deck attitude. Our day was very special and we are so happy we chose you to finally make us Mr & Mrs!" Then, another hour later, the groom wrote this! "Patient, friendly, intelligent, creative and awesome. I didn't know what to expect from a celebrant but he clearly smashed any preconception I had about what he was supposed to do. He created a beautiful ceremony from the meagre morsels of information my girlfriend and I supplied, beautifully executed and calm and worry free. His creativity left us little to do and combined with the location, people and weather, Stevie made the best day of my life into the most beautiful. Always going the extra mile and never satisfied with adequate. Nothing mediocre about this man, if you are reading this with wedding plans in mind then read no more, he comes with my unreserved recommendation, everything you will need and want and then a bit more. Thanks Stevie, eternally."